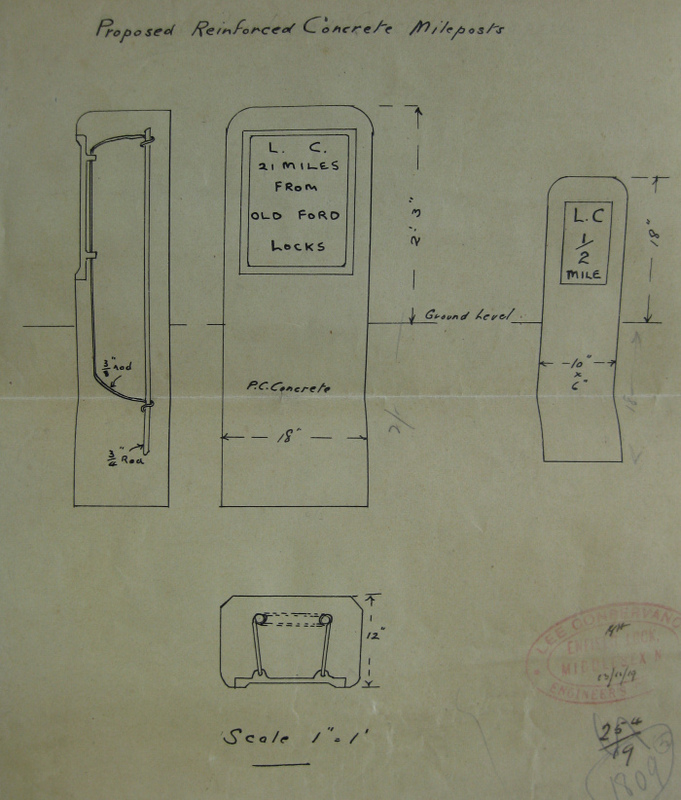 "MILEPOSTS, Casting of. 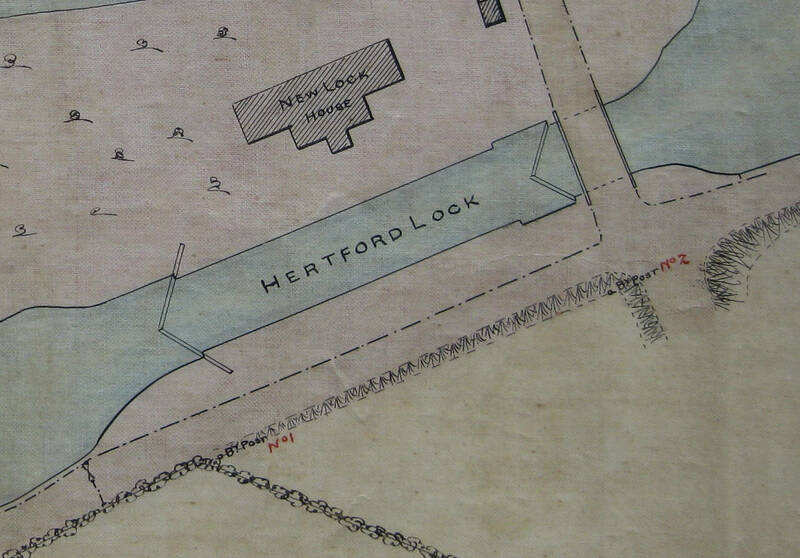 In reference to the new list of Tolls which is based on the Maximum Tolls allowable on the mileage system I think it would be advisable to have posts placed in the towing path denoting the miles, quarters, halves and three-quarters from Old Ford Locks to Hertford. The accompanying sketches show the posts I would suggest which consist of cast iron plates embedded in reinforced concrete posts. I estimate the cost of the posts and fixing at about £175." 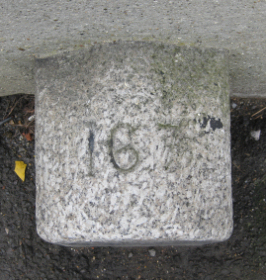 As can be seen from the design above, Charles Tween was determined that the plates should not easily be removed from the concrete posts by souvenir hunters. 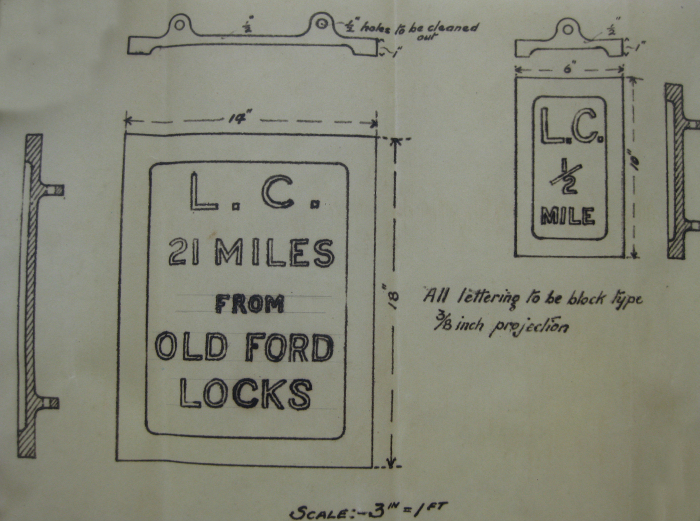 The order was placed for 24 of the large plates with the mileage from 1 to 24, and 25 of the ½ mile plates and 6 each of the ¼ and ¾ mile plates. Whether this was done as an act of national security at the start of the second World War or as an act of corporate vandalism later is yet to be discovered. 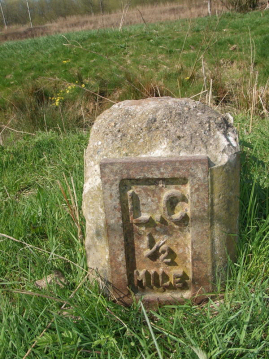 The surviving mile marker is at Edmonton. 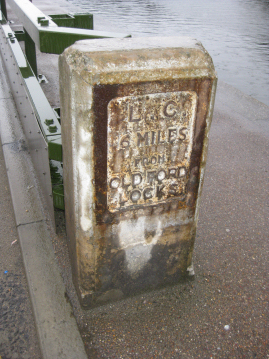 The ½ mile markers are at Hertford, Dobbs Weir, Broxbourne, Kings Weir, Cheshunt, Waltham Abbey and Ponders End. 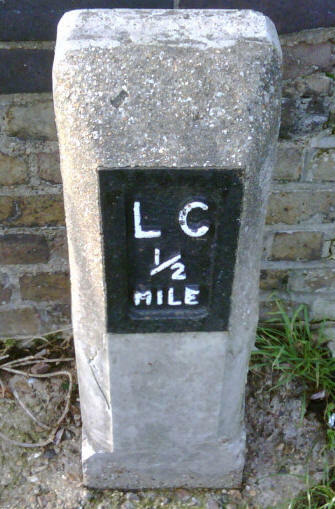 The ¼ mile markers are a quarter of a mile above Old Ford Lock and about a quarter of a mile above Marshgate Bridge, Hackney. My thanks to Florence Salberter, Richard Sales and Neil Leslie of the Canal & River Trust (formerly British Waterways) and Mike Hallett for the locations of these posts. Approximately 100 metres downstream (north-east) from Folly Bridge outside No 8. Approximately 680 metres upstream (north-east) of bridge 55 at Dobbs Weir. 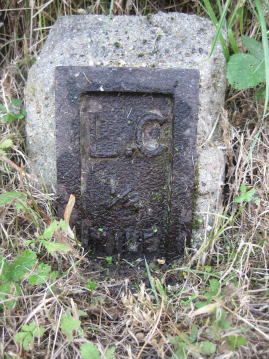 The grid reference is TL 3903 0851. Approximately 275 metres downstream (south) of Crown Bridge opposite Broxbourne Rowing Club. 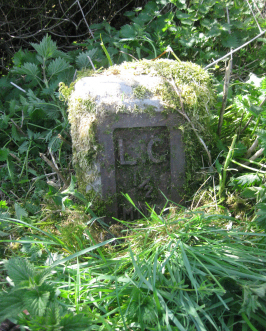 The grid reference is TL 3723 0652. Approximately 30 metres downstream (south) of King's Weir bridge, about ½ metre into the weeds. Approximately 260 metres upstream (north) of Cheshunt Lock. 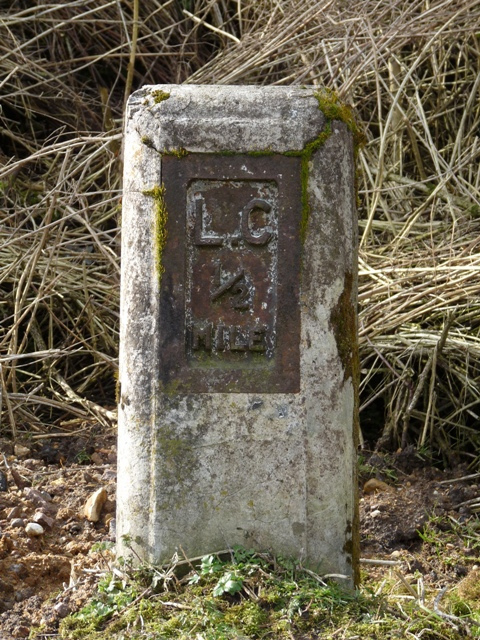 The grid reference is TL 3714 0338. The stone is south of Highbridge Street, immediately adjacent to the abutment of bridge 41. Bridge 41 is a side bridge that carries the towpath over the entrance to a boatyard / marina. From the towpath it is easy to miss this stone - you have to turn back along the canal bank almost under the bridge to find it. The grid reference is TL 3758 0036. Approximately 350metres north of Ponders End Lock, just south of the railings over the weir. At the side of the Navigation on Towpath Road, just north of the junction of Silvermere Drive, in the Harbet Road Trading Estate. 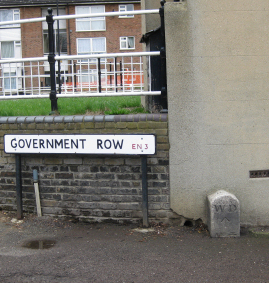 This may not have been the original position as the 6 mile point on the Navigation is almost exactly where Bleak Hall Bridge used to be before the North Circular Road was widened (about 210 metres to the north). 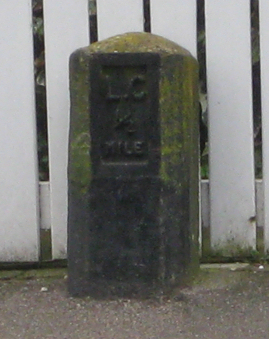 The quarter mile post is about a quarter of a mile north of Homerton Road Bridge. It is at the back of the towing path, just in front of the railings and possibly obscured by vegetation. 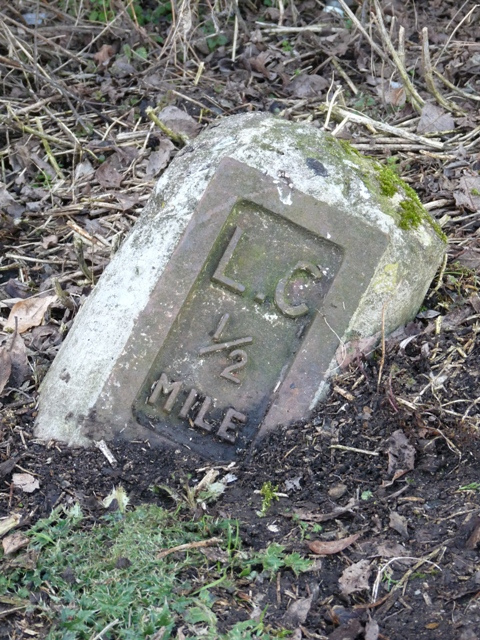 The other quarter mile post is (logically) a quarter of a mile north of Old Ford Lock. Photo (and discovery) courtesy of Florence Salberter, B.W. 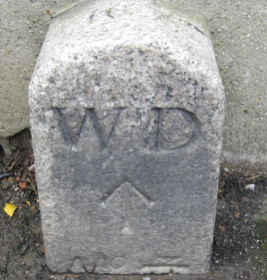 Quite late in their control of the river (which ended in 1868) the River Lee Trust placed markers at the some of the boundaries of their jurisdiction. 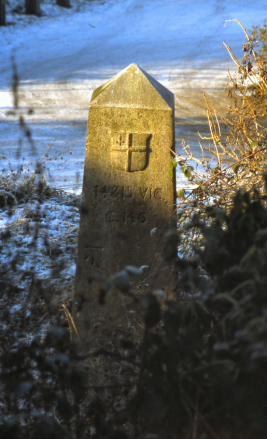 How many of these posts were erected is unknown but two have recently been discovered, one at Hertford Lock and another at Stanstead Abbotts Bridge. 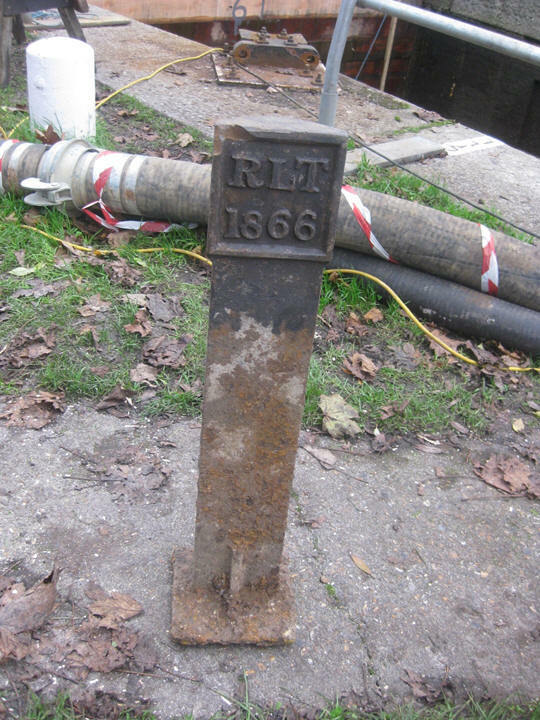 The post at Herford was discovered when the lock was being re-gated in December 2014. One of the workers tripped over a piece of cast iron just visible in the ground, an on investigation discovered the post. The casting is in extraordinarily good condition. The inscription is RLT 1866. The Trust obviously did not want the post to be easily removed judging by the size of the anchor plate at the base. It took some determined work with a JCB to persuade it to come out of the ground. Close examination of the plan will reveal " BY Post No 1" just below the lower end of the upstream gates, which is exactly where the post was found. There would appear to be a second post near the downstream end of the lock but this hasn't yet been investigated. 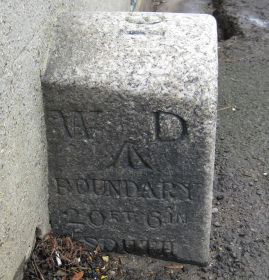 In July 2015, another boundary post of a different design was discovered near the western end of the river bridge in Stanstead Abbotts. One wonders how many people have tripped over it in its (presumably) nearly 150 year existence. 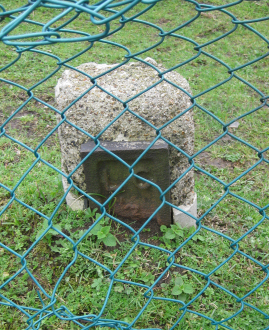 Nothing to do with the mileposts or boundary posts but there are two other interesting markers beside the Navigation. The other post is just behind the towing-path to the south of Kings Weir Bridge. 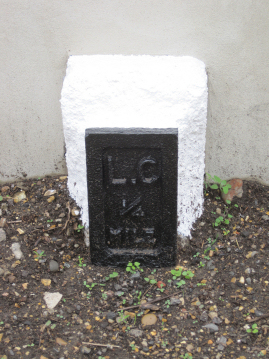 Is is an unusual version of the Coal Tax posts which ringed London marking the Metropolitan boundary where Coal Tax became payable.